Don't let the tough economy impede your Cooperstown trip planning -- it's possible to have family fun on a shoestring budget with many free and inexpensive things to do! There's no question we are living through financially troubling times. Many parents work second and third jobs just to make ends meet -- and then are greeted by rising gas and food costs. It's no wonder people are thinking twice about that extended vacation, let alone just the occasional need to go out to dinner locally one or two times a month. While we encourage fiscal responsibility, we also have solutions to budgeting for your Cooperstown vacation, should you decide to travel. If budget-busting hand-rubbed garlic chicken with a drizzling of some obscure oil isn't your meal-ticket, then Cooperstown offers some real dining bargains. Tino's Pizza (75 Chestnut St., Tel. 607-547-2930) offers delicious thin and thick crust pizza as well as well-made, substantial subs in a pleasing traditional storefront, sub shop setting. The Cooperstown Diner (136 1/2 Main St., Tel. (607-547-9201) beats most of its competition at what they do by offering hearty breakfasts, lunches and dinners at low prices that would have Alan Greenspan scratching his head on how they can be so affordable in this day of age. It's a charming diner -- small, friendly and full of great conversation, coffee and food. T.J.'s Grille (124 Main St., Tel. 607-547-4040) is a populist's favorite offering great meals from morning to late evening, including great scrambled eggs, a phenomenal roast chicken dinner and fruit pies. The Doubleday Cafe (93 Main St., Tel. 607-547-5468) may be on the more expensive side of "cheap" at dinner, but its surprisingly creative flair at relatively less expensive prices make it a hometown and tourist's dream. Lunch is always a good value at the Doubleday, also. The Stagecoach Deli (31 Pioneer St., Tel. 607-547-6629) might just be the best-run eatery in Cooperstown, offering quick, efficient service and terrific wraps and paninis, baked goods, coffee and ice cream. They also have a relaxing backyard patio, perfect for a leisurely summertime lunch. Dimaggio's (4561 State Highway 28, Milford, Tel. 607-547-5400) does fast food the right way. Located directly across from Cooperstown Dreams Park on the ever-expanding Route 28 Southern corridor, Dimaggio's serves tasty, full-bodied hot dogs, substantially-sized burgers, excellent salads and some very large portions of ice cream. The dining room is spotless, the service quick and courteous, and the atmosphere family-oriented. It's a great choice for a quick and affordable meal. Down the road in the pleasant and interesting city of Oneonta, NY, is Brooks Bar-B-Que (5560 State Highway 7, Tel. 607-432-1782), famous for some of the best barbecue chicken, pork spareribs, beef, pork and steaks this side of the Mason-Dixon line. Brooks isn't one of those "Johnny-Come-Lately," trendy barbecue joints that serves, wimpy, watery rotisserie meats. With the largest indoor charcoal barbecue pit (38 feet in length) in the East, Brooks Bar-B-Que certainly isn't for the macrobiotic, vegetarian crowd as this 300-capacity family-oriented restaurant serves high-quality, hearty portions that never disappoint. The great food, low prices, efficient service and cleanliness make Brooks a must-visit dining spot when visiting Cooperstown, even if it is a half-hour away. The thrill of watching America's Favorite Pastime at a true American ballpark never gets tired. 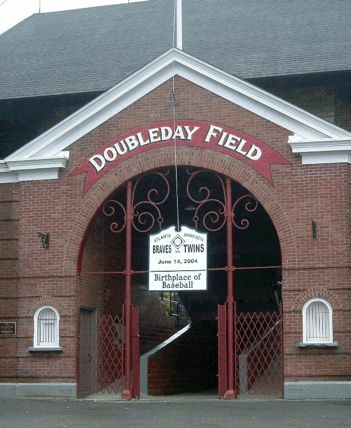 With free admission and ball games going on all day during the baseball season, Doubleday Field is a throwback to an era when baseball was played for the love of baseball and nothing else, set in a family-friendly ballpark. If only every community had something as special as the Clark Sports Center, located on a scenic country road minutes from the center. Here, you can buy a $8.00 day pass ($4 for children) to use the Olympic swimming pool, weight training room, track, bowling alley, and climbing wall and racquetball and basketball courts. 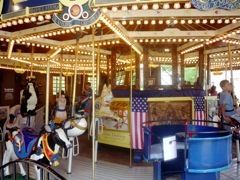 Two dollars for adults and half of that for kids will get you on the Cooperstown trolley, taking you to some of Cooperstown best attractions, as well as the Cooperstown Chamber of Commerce information center. 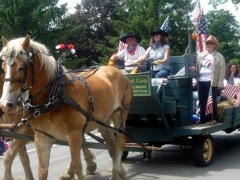 On the way, you'll see some amazing old homes, the charming downtown, Otsego Lake, great neighborhoods and many other landmarks, attractions and ways-of-life that make Cooperstown a special place. It's a great tour! Whether it's a Tuesday night free summer concert or just having a quiet picnic on the expansive green lawn overlooking beautiful Otsego Lake, Lakefront Park proves you don't have to spend money to bring home lifetime memories. To many, Lakefront Park seems like the nicest place in the world, given its amazing scenery and relaxing location. The old-book smell, the pleasant, dedicated staff, the historic looking hall way and stately tall pillars supporting this old-time building lend a wonderful old-fashioned experience. One might not think of going to the library during vacation, but why not? It's leisurely, relaxing and is well integrated into the charming Village of Cooperstown as a community landmark. 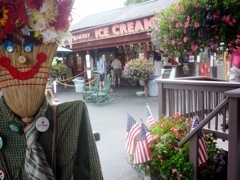 For a small Village Cooperstown has an amazing amount of culture, including many art galleries. Check out the local talents of artists at the Cooperstown Art Association (at the Cooperstown Village Library), Smithy-Pioneer Gallery and Leatherstocking Brush and Palette Club (both on Pioneer St., in the downtown). For $6.00 a car, your family can enjoy one of the cleanest lakes in New York State and wonderful rural scenery. Glimmerglass State Park's beach has coarse sand and a large shallow swimming area. There's also changing rooms, a refreshment stand, crackerjack lifeguards doing their jobs, and some truly lovely park area, perfect for camping, hiking and barbecuing. This non profit market located showcases, in the summer and early fall, the products of local farmers and producers. This includes fresh fruit and vegetables, meats, flowers, herbs, potted plants, prepared foods and crafts. It's always a great experience meeting the hard-working, nice, decent people that earn money through their works of love. Do you have a budget-saving idea for vacationing in Cooperstown? Write your review here! * Your email address will never be sold, rented or used for any other purpose than writing a review.